The whole nation, it seems, has been in mourning these past few weeks due to gun violence. Here in our own community of the Rockaways, the heartbreak has been intensely personal, as we have lost two 15-year-old boys, Trevor Rhudd and Youssef Soliman, in the past two months to senseless gun violence. Parents, young people, and community members of all ages are coming together to say enough is enough. Violence has been too much a part of life in the Rockaways, and there has been a groundswell of community support for efforts to reverse the trend. 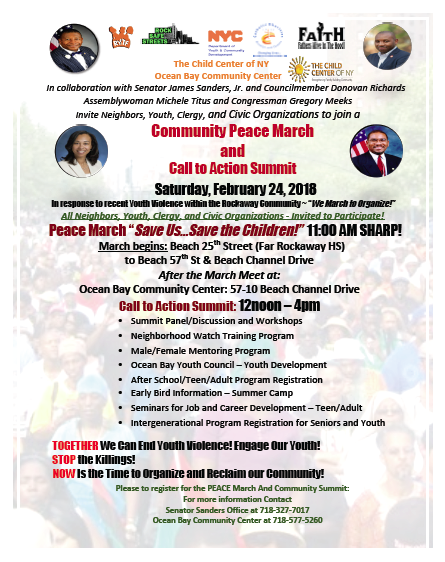 To bolster these efforts, The Child Center of NY and other neighborhood partners, clergy, and elected officials are organizing a community peace march and call-to-action summit on Saturday, February 24th. The march will begin at 11:00 a.m. at Bay 25th Street (Frederick Douglass Academy VI, formerly Far Rockaway High School) and will continue onto Beach 57th Street and Beach Channel Drive. 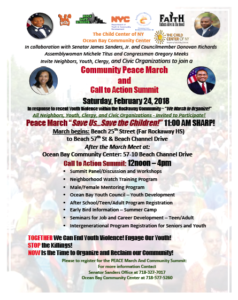 Following the march will be the Call-to-Action Summit at Ocean Bay Community Cornerstone Center (57-10 Beach Channel Drive) from 12:00-4:00 p.m.
Marchers are wearing white to symbolize peace and unity. The event is rain or shine. 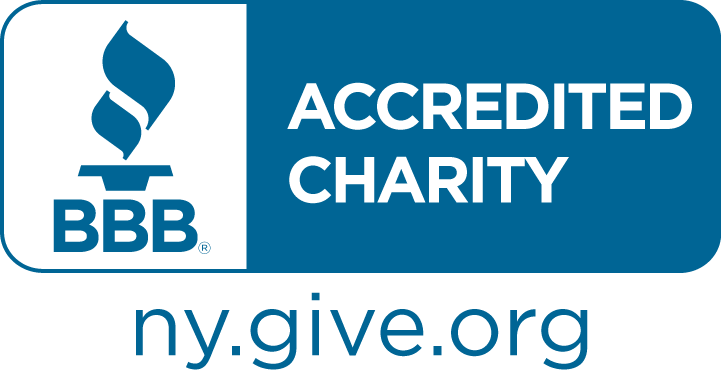 One of the most encouraging parts of the event so far is that it has been community driven. There is a growing consensus that it is time to unite and work together. 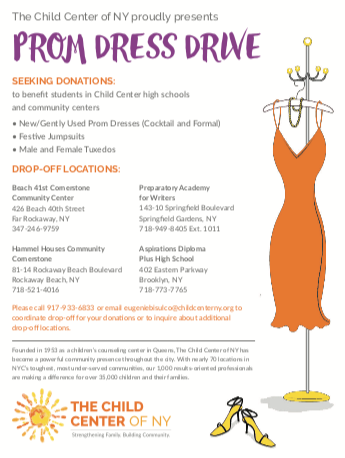 We invite all who feel the same to stand with families and communities affected by youth violence in the Rockaways. “We want the youth of our community to know that their lives matter, the lives of their neighbors matter, and they each are so full of strengths and potential. 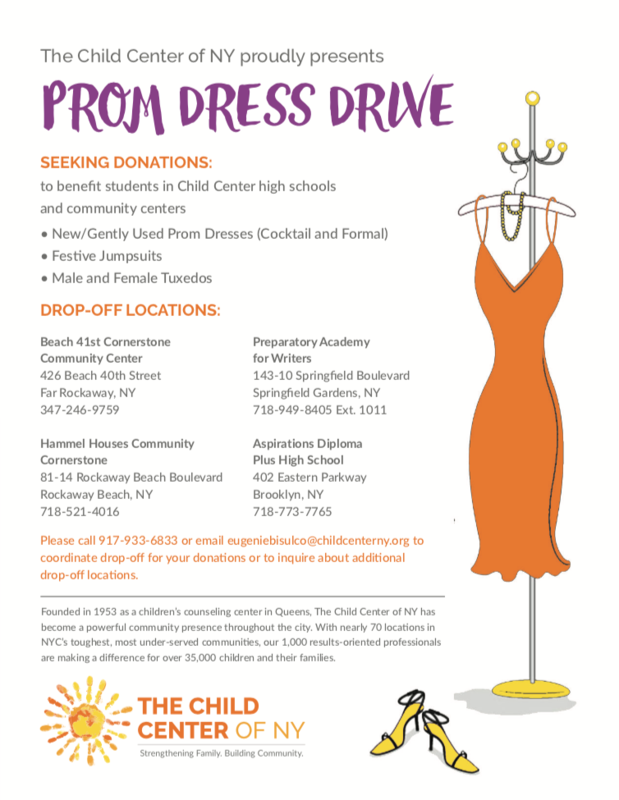 We at The Child Center of NY will do everything we can to help them realize that potential. It’s time to end the violence, engage our youth, and reclaim our communities and our promise,” Hoyle added. For more information or to register for the event (registration is appreciated but not required), please contact the Ocean Bay Community Center at 718-577-5260 or Senator Sanders’ office at 718-327-7017 or 718-523-3069. Please download and share the flier for the event: Community Peace March and Call to Action Summit.